Vintage - Lustreware Tea Set. 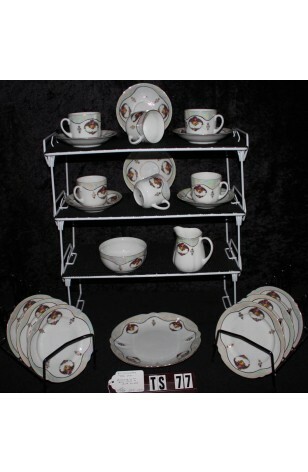 A 21 Piece Set, Service for (6) Six, Made in the 1940's. A Beautiful Scalloped Lustreware Tea Set having a Service for (6) Six, by an Unknown manufacturer. A Lovely White Opalescent Background with Mint Green Border, Red & Yellow Flowers in Wreath Shape. Has 22kt Gold Verges, Rims, Handles and Accents on Items. This is a very striking Tea Set and Green Lustreware is Rare indeed. Excellent Condition. A Beautiful Scalloped Lustreware Tea Set having a Service for (6) Six, by an Unknown manufacturer. A Lovely White Opalescent Background with Mint Green Border, Red & Yellow Flowers in Wreath Shape. Has 22kt Gold Verges, Rims, Handles and Accents on Items. This is a very striking Tea Set and Green Lustreware is Rare indeed. In Great Resale Condition unless noted below or in pictures.